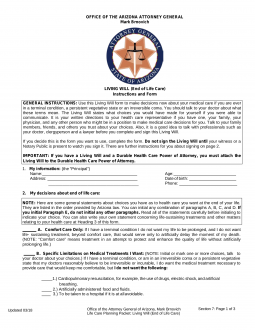 An Arizona living will is a legal document that would allow one to provide a written statement outlining their desires with regard to their medical treatment in the event circumstances change and they are no longer able to provide instructions about their medical care on their own. With this document, the principal states the decisions they wish to express while of sound mind. No family member or friend will have the legal ability to change these decisions and so you may wish to speak with a qualified attorney, member of the clergy and/or your Doctors before putting this information into your medical file. Signing Requirements – One (1) Witness or a Notary Public. Medical (+) Power of Attorney – Allows a person to select someone else to make health care decisions on their behalf only if the person is not able to make the decisions for themselves. 2.) Artificially administered food and fluids. C. Pregnancy: Regardless of any other directions I have given in this Living Will, if I am known to be pregnant I do not want life-sustaining treatment withheld or withdrawn if it is possible that the embryo/fetus will develop to the point of live birth with the continued application of life-sustaining treatment. D. Treatment Until My Medical Condition is Reasonably Known: Regardless of the directions I have made in this Living Will, I do want the use of all medical care necessary to treat my condition until my doctors reasonably conclude that my condition is terminal or is irreversible and incurable, or I am in a persistent vegetative state. Step 5 – Notarization – Once the notary public has witnessed the signature of the Principal or Witness, the notary must carefully review the “Witness” section just before notarization. If the notary public is in agreement with all of the statements, then the notary will complete the remainder of the document(s) and authenticate by affixing the state seal.